We are sure that all of you have felt asleep in those boring Monday morning classes. All our college life, we tried to find a solution to sleep in class without getting caught. Actually, it was a dream for all of us to sleep in a class when we are extremely tired. Now, there’s a guy who has found a hilarious way to sleep in a class and too without getting caught by your teacher’s eyes. Yes, you read that right, your wish is going to come true. You may have heard about YouTuber Zach King, who is famous for his magic tricks. 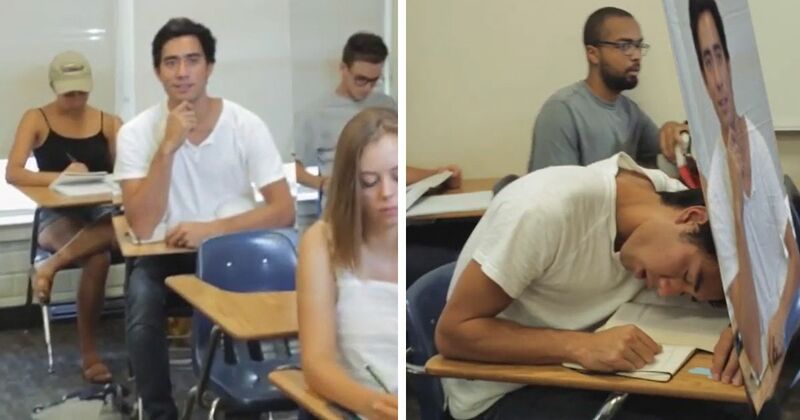 Well, the guy claims to have found a hilarious way to avoid getting caught sleeping in class. The above video has gone viral lately, it shows a class of young individuals sitting in the classroom and listening to the teacher. But, there’s one guy at the back who looks like particularly keen to learn. The next moment, the camera zooms in and it is revealed that he is actually sleeping behind a life-size portrait of himself that perfectly matches with the background. The next moment, his friend pokes him to warn him about the teacher and he quickly whips the board away and struggles to open his eyes wide open, showing as he is actually listening to the teacher. Although, the complete video is a setup but that’s a hilarious way you can use to sleep in class without getting caught. Related: Learn Tips On “How To Cheat In Exam?” Like A Pro.